contiguous US only, call for Hawaii and Alaska shipping. 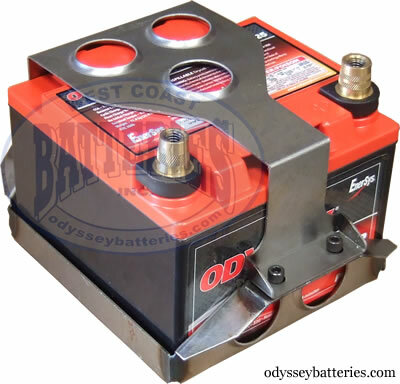 Welded, bent and perforated steel ODYSSEY battery mounting brackets for many ODYSSEY battery models. Bare metal finish suitable for painting or powder coating. Includes nut certs and screws. Only fits the non-jacketed PC925, PC925L, PC925T and PC925LT. Does not fit the metal jacketed versions PC925MJ, PC925MJT, PC925LMJ and PC925LMJT. Tray measurements (footprint) 7" x 6 3/4"
Tray measurements (widest) 7" x 8 3/4"